Should You Thin Your Tomato Fruits? As gardeners watch their tomato plants load up with green fruits, the question of whether or not to thin them can keep you up at night. To make things worse, thinning methods that work in one climate can prove disastrous in another – so much so that debates between American and European gardeners on the subject have led to nasty conflicts. In order to set the record straight – and help you grow your best crop of tomatoes – here's a global report on thinning trusses of tomato fruits. Tomatoes are tropical plants that run on sun, so an abundance of sunshine helps them to grow faster. Where you are on the globe, as well as your area's cloud cover patterns, determine the intensity of sunlight that reaches your tomatoes. Gardeners in the UK and northern Europe (north of the 50th parallel) are just plain out of luck here, because your July solar intensity (insolation) rating is a measly 4.7, compared to 6.0 in St. Louis, Missouri (located at the 38th parallel, close to the center of the US). The farther you live from the equator, the more your plants will be affected by limited sunlight intensity. The distance from the sun also affects daily temperatures, and low temperatures slow the growth of warm-natured tomato plants. Again looking at July, the average high/low temperatures in Jeremy's garden in Liverpool are 68°/55°F (20°/13°C), while those in St. Louis are 91°/71°F (33°/22°C). Taken together, reduced light intensity and cool temperatures lead to 4 to 5-week maturation lag for tomatoes grown in high-latitude gardens. This difference is reflected in the days-to-maturity ratings given by European vs. American seed companies. For example, 'Sun Gold' cherry tomato needs 95 days to mature in Jeremy's garden, but only 60 days when grown in most parts of the US. Similarly, 'Moneymaker' is rated at 95 days in the UK, compared to 75 days in the US. With this much understood, it makes sense that high-latitude gardeners should use different methods than gardeners who live in much warmer, sunnier climates. On the cool-climate side, most gardeners favour handling tomatoes as cordons. European gardeners often substitute "cordon" for "indeterminate" when discussing tomato growth habits, but cordon pruning (to a single trunk) actually describes a method developed by grape growers, and later applied to greenhouse-grown tomatoes. Here's how it's done with garden tomatoes. 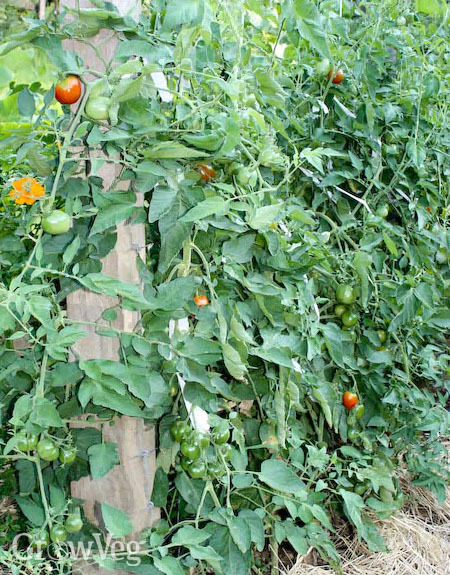 Using early, indeterminate (tall, long-bearing) varieties, cordoned tomatoes are pinched and pruned to one or two leaders, and tied to a stake. The plants are allowed to produce up to 7 or 8 flower clusters, which become trusses of tomatoes. Once the green tomatoes have formed, future blossom clusters and suckers are clipped off to help the plants concentrate on ripening their crop. In addition, crowded trusses are thinned so that the ripening fruits won't crowd each other so much that they lose their shapely curves. Many US gardeners use the cordon method when growing tomatoes in containers or partial shade. However, research studies from Mexico, China and the US have shown that tomatoes in warmer climates produce best when they are allowed to produce a thick foliage cover, as they do when grown in wire cages. Contrary to what many gardeners believe, thinning of tomato fruits in warm summer areas has no effect on the flavour or nutritional value of the remaining fruits, and only a slight influence on fruit size. In fact, fruit thinning may increase problems with fruit cracking, especially if you thin fruits just before a heavy rain. Commercial growers often thin to enhance uniform ripening, but home gardeners have little need for a crop that ripens all at once. Regardless of where you live, the arrival of autumn frost creates an excellent reason to thin tomato fruits. In late summer, tomatoes need 8 to 9 weeks to go from blossom to ripe fruit. If you count back 10 weeks from your first frost date, you know when your tomatoes are starting to waste energy by producing doomed flowers and fruits. My first frost comes in early October, so I start clipping off tomato blooms in mid-August. Tossing beautiful blossom clusters into the compost heap is a hard thing to do, but it helps me understand the resolute, pinch-or-perish attitude high-latitude gardeners must maintain with their tomatoes all season long. "Interesting facts that I wasn't sure about. I had heard about the pinching back of leaves. Thanks." "Excellent article. Now I can effectively stop the folks from the northern US from having a bad tomato season here in the south by explaining how tomatoes work. I never knew why caging and letting indeterminates grow on their own worked but I knew it did. This way nobody is "wrong"; it's just depends on where you live. " "This year I tried pruning the suckers off all of my tomato plants and learned a lesson, at least one that might work for me in the future. The pruning has worked well for all but my early tomatoes like 'early girl' and 'celebrity.' They're producing okay but it has really stunted the plants growth. I won't prune them again or perhaps just reduce the pruning quite a bit. I'm fortunate to live in Southern California and have a long growing season. Since they don't appear to get to big anyway and they produce early enough in the season, I'll stake them higher or let them ramble from now on. " "But if you clip off all your late blossoms, you're missing out on the green tomatoes that you can harvest the day a frost is expected--some will ripen on the counter or windowsill, and the rest you can use for pickles or green tomato chutney. I've had fresh tomatoes at Thanksgiving by leaving them on until the last second." "Linda, you make a great point. I agree that if you want to get plenty of green tomatoes in fall, you would wait until 6 weeks before your first frost to start clipping off blossoms. Seriously immature tomatoes will never ripen indoors, and they often taste bitter. In my garden, I often root a few tomato suckers in early summer so I'll have vigorous plants for a fall crop. " "I am growing tomatoes for the first time, and they seem to be going balistic. I planted into 12" pots then cut the bottoms off and put them in grow bags. I have always pinched out side shoots and when I had 6 trusses I began pinching out new shoots at the top, but they just produce more trusses lower down - there are 10 on each plant now and keep trying to produce more also the height is increasing..?? They are more like tomato trees than plants. How ruthless should I be in pruning back side trusses and top growth. I live in Essex. England." "Last summer, in southern England, the weather was terrible. Nevertheless we had a good crop of tomatoes in the greenhouse (grown cordon-style) - but they remained green after the plants began to die back. I cut all the trusses off, laid them out on greenhouse staging, and brought them into the house a few at a time. We had naturally-ripening tomatoes well into October. Well worth not giving up!" "Sharon, I am interested in the fact that you got naturally ripened tomatoes this way since I got far less late tomatoes last year - the wet weather meant most of my plants suffered with blight. Hopefully this year I will get the chance to try this." "Lynda, At this stage, I would suggest pruning back any of the trusses that have very little fruit on. I added a large amount of compost to my front garden this year and have had similar experiences with the tomato plants I planted there having a lot of leafy growth. I recently pruned off a number of lower trusses that were mostly leaf and little fruit in order to 'open up' the plant and help ripen the fruit that has set." "Thanks Jeremy, I have thinned out the bottom leaves, but the fruit has set and I have up to 10 tomatoes on a some of the lower trusses - should I thin out the tomatoes themselves and carry on clipping off the new flowers at the top and sides as they appear?" "Lynda, don't worry about having a lot of fruit set - at this point in the year there is still time for them to ripen (apart from of the larger beefsteak varieties of tomatoes which do benefit from a bit of thinning). Once we get nearer the end of the summer then you may wish to thin out the smaller fruit." "Thanks again Jeremy, helpful advice for a novice fruit and veg grower like me. I look forward to going down the garden to pick my tomatoes, also the peppers if they are a success. " "Hi, Im from christchurch new zealand. Interesting article, for the first time im growing tomatos this year(moneymaker) and i had already starting wondering as to wether thin the fruit at all as on some truses i have up to 15 fruits and i just didnt see possible for the fruit to get to a good size being so tightly spaced. I had already started doing some tests by thinning the fruit on two of my six plants. Everybody down here "pinchs" the "lats" out. And i had googled moneymaker so was growing till 6 or 7 truses and taking the top out as was instructed by the seed selling companys that i had found. A couple of the slower plants i instinctively took there tops out at as little as 3 or 4 truses just to make sure they were not late and perhaps even they will be the first now. All good fun, love growing stuff." "Jim, you are doing what every tomato gardener should do -- watch the leaf to fruit ratio, and thin fruits if the plants seem overloaded. Every variety seems to want different handling, but it's still a good idea to get to know several varieties. It's great to hear your report from NZ, because it's so reassuring to know it is summer somewhere." "Haha, summer somewhere, well that could be debated this year. With this Ill nino weather patern this year it is hardly summer, it is overcast most days and every person growing a plant in this country is very aware of this. I go pick cherries most years and in that area(Cromwell - central Otago) it should be well over 30 degrees centigrade most days but this year it only got over 30 a couple of times." "P.S. I did some googling and was having a look at some of the tomato varieties available. Next year im definatly not frowong something as boring as a moneymaker! lol. Cherokee Purple sound very cool(get them in very early of course) and some other more exotic verietys. I can't wait." "My Gardener's Delights have now hit the roof in my small greenhouse and I've been forced to "top" them. I've been pinching out the suckers in the leaf "arm-pits" and have been left with a nice single stem. My concern is this, each plant only has a single truss of flowers at the very top of the plant. I'm sure I haven't pinched out any others. Will additional trusses form lower down the main stems or am I destined to only have one per plant? Thanks." "Bob, it sounds as if you may have removed more than just the 'arm-pits' which are the stems which grow between a side shoot and the main stem, heading up at 45 degrees. The side stems should still be left in (as shown in the picture on this website: http://www.gardenaction.co.uk/images/tomato_side_shoot.jpg). I don't think you'll get extra trusses growing lower down but you will probably get superb tomatoes from the truss at the top." "Hi Jeremy Having looked at the picture I am sure I have only removed the shoots between the leaf joints and the main stem. I waited until the leaves had started to develop and the shoots were obvious. The fruit trusses are much more distinctive. Thanks anyhow"
"Bob, yes the fruit trusses are distinctive and come off the main stem separately from the side shoots and 'armpit' shoots, so it's very odd that you haven't got more than one on each plant." "What is the best way to support tomatoes ? Do I want to use a wire cage or do I want to use a wood frame or just buy a store bought cage?" "JR, I think any of those methods can work well and it's largely down to personal preference and how large your tomato plants get. You just want to make sure that the supports are sturdy." "This is a great article! Next problem, with a dry April and a wet May/June my tomato leaves have gotten curly - is that from too much water? Too Little water? or are they merely putting all energy into the fruit so leaves wither? Or can this be a result of not thinning enough/too much etc.? P.S. I live in London"
"Some varieties have naturally curly leaves, but when moisture is a question with tomatoes, it's generally best to veer toward dry. Also, is there any possibility that your garden could have been touched by herbicides? Unusual curling is often a symptom of chemical damage, soil-borne or from herbicide drift. " "Thanks! Lots of rain the past few weeks - hard to keep my outdoor tomato beds on the dry side. I haven’t used any herbicides, unless something was initiated into the soil improver that I used. Guess I’ll just have to ride it out and hope for the best - may also try to do some feeding as they begin to produce fruit. " "Hi i am growing Marmond tomatoes upside down in a planter. They are beside the window and are hanging about 2 ft down but there are still no flowers or fruit after 6-7 weeks of growth. Do they take a long time to form? I have french beans in a large pot beside them which are thriving. (Northern Ireland)"
"In Ireland and the UK I'd expect no flowers yet - for me in Northern UK they take about 2 months before the flowers appear and fruit starts to set. However, if you still get nothing after a few more weeks you should consider whether they are getting enough water and whether a liquid feed such as seaweed feed would help." "Many market gardeners here prune to a single stalk - and while I'm fine with pinching off suckers I have no idea how to get to this goal. Where does one cut? Do you dip your shears in a bleach solution like with some shrub pruning? Thanks in advance - I really trust your advice!" "Linda, the single vines must be trained early on, with all low suckers pinched off. The main vine is trained up a rope or other vertical support, and only a few selected suckers are allowed to grow. Instead of a bleach solution, a bowl of milk is recommended for dipping hands and tools when doing a lot of tomato pruning. The milk neutralizes viruses which can be mechanically transmitted. " "I am needing help disparately I am in Western Australia plenty of sun and lots of water. I have planted a lot of tomato plants from seed money maker variety. I have lovely looking plants with lots of red healthy looking and smelling tomatoes BUT they are so bitter they are inedible! It's so sad I'm picking them off the trusses and chucking them in the bin. I have just about asked everyone I can think of, I'm hoping someone out they can help me to save them or fix them for the next crop! Thanks in advance "
"Cheryl, after doing some research on your question, I am wondering if your soil is low in potassium. Compost usually provides this nutrient, but you can add more with kelp meal, wood ashes, and even orange peels. I'll keep looking for other possible explanations. " "I have one early girl tomato plant that has grown about 4 feet tall and has lots of green tomatoes and a lot of flowering going on. Its very thick with leaves and I'm afraid the tomatoes on the inside won't turn red. I'm in Wisconsin and we haven't had a lot of REAL sunny days, usually partial clouds. Should I clip off leaves and flowers?" "Joy, in your climate you are at a turning point in the season; after mid-August new tomato fruits that set won't have time to fully mature. You can trim off new branches with flower clusters, but otherwise let the plants keep growing. Your tomatoes will continue to ripen for the next six weeks -- hope you have a great crop. " "Hi, thanks for a great article (and comments)! I have a concern regarding my cordon variety (Gardeners Delight). I'm growing outside in a pot, stringing the plant up. The plant is looking great and I have 7 trusses with tomatoes/flowers atm. My concern is this - some of the first trusses have up to 16 tomatoes on them. Should I/could I thin out some of the fruit on these? I'm worried the stalks might break, as they are on the thin side... Live in London, UK btw. Happy for an answer if someone's still following up on this thread!" "I would see if you can support the trusses by tying them up with strips of stretchy cloth (like tee shirt fabric) since they are so close to ripening. Good luck!" "Great tip! Should do the work. Thank you very much! :) "
"Hello Barbara: This is Rahul from India...went thru your well written post about tomato's and found it very informative...I am very new to gardening and I have a very unique or shall i say stupid :) query for you...I recently bought tomato from my local store and pulled out seeds from the fruit and sowed them in a pot...had three but only one survived and doing okay...its 5 feet tall now and still growing its flowering and fruits are visible although small (size is very similar to golf balls)...now the Question...How Do I determine the variety of tomato?? Can you help?? How can I get the heirloom seeds? Any help will be highly appreciated...thanx a ton for your time. " "Rahul, it is most likely that the seeds you planted were produced by a hybrid plant with a very complicated pedigree that will be impossible to trace. Rather than looking for Euro-American heirlooms, I suggest considering the Indian heirlooms available at GreenMyLife.in or another seed company that is accustomed to meeting the needs of gardeners in India. Good luck!"